I had hoped to have this done today, but life takes precedence. I made this wall hanging for my sewing room wall to remind myself that it's not the destination--it's the journey. I have been blessed by all the wonderful people I've met through Pink Doxies and quilting. One hundred posts, and dozens of new friends. Thank you. I'm inviting you to join me in celebrating my 100th post. It's officially Party Time this weekend here at Pink Doxies! The Doxie Girls woke me up early to get ready for this special day. and then they ran around squeaking toys and blowing horns. Most of all, this is my time to thank you for your readership and support. I started here at Blogger 6 months ago showing you what I was making, where I'm from, and what I love. So, sewing, quilting, Ohio, my family, intense color, the Doxie Girls, and llamas. Blogging was a simple step in redefining and recreating ME. As a homeschooling parent, my children's education was my priority, and I did little else for 16 years besides keep up. When the last one graduates, that job department will be eliminated. I'm almost there, and had to pursue a new job title. I'm slowly turning back into the ME I was before kids. The trick here is not mortifying the family while it happens. As for blogging, I'm having fun here, and definitely, am still learning how it all works. You'll continue to see new posts several times a week. I've added an About Me page today in the header up top. Older posts will continue to have labels added so you can search for them, and Pink Doxies will continue evolving, and getter better for you. Doxie Girls who you are. Keeping with the Pink Doxie theme, it's a Pet (Project) Show. 1. Use the blue 'Add Your Link' button (below left) to post a picture of something you've been creating in the past week. It can be any kind of handiwork created with needles. Sewing, quilting, knitting, crochet, needlework, etc. It can be a work in progress, finally finished, or the new fabric you just discovered. Whatever it is that inspired you to create this week, we'd like to see it here. 2. Please link to a specific post, and not just your blog address. It makes it easier for someone following your link to find your project. 3. 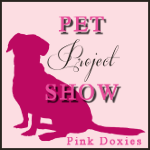 Provide a backlink to Pink Doxies with a link in the post or pick up our Pet Project Show button. The button link is on the sidebar. Copy and paste into the 'Add Image by HTML' box to create the Pet Show widget on your page. Either way you link up, remember it's a party here, so schmooze with the crowd! Pick two or three others who've linked up, and visit their link. Leave them a comment so they know who you are. The people to either side of your link would work, or their neighbors, too. It's not required, but feel welcome to follow me on Bloglovin' or by email. The Linky Party starts now, and runs until Monday, January 12th at midnight. Spread the word, and tell all your stitchy friends. Congrats on your FIRST 100......I am sure this is only the beginning. My hat is off to you. Home Schooling Moms are cool, and deserving of a reward. You are setting a great example. You'll never be the 'much talked about empty nester'.....You have an art, a hobby and a craft that brings you joy. Keep going......sew sew sew. You are MY inspiration, Irene. You give freely of yourself, your spirit, and your energy. Thanks for being my cheerleader, dear friend.